For as long as we have a history, people have created instruments, or constructed tools, to strike, blow, bow, and stroke objects to omit sounds. Study of musical instruments is organology. Elementary organology classifies instruments based on major elements (i.e.state of matter) of the earth, air, water, fire, and idea. The major matter elements relate to states of matter: solids, liquids, gasses, plasmas, and informatices. Next, and most recognized, the elements and states link to categories of instruments: Gaiaphones, hydraulophones, aerophones, plasmaphones and quintephones. These elements and states categorized historical elements for centuries. With today’s technology, new inventions change and create musical opportunities monthly. In this activity, you construct different types of musical instruments including ones of your very own invention. Begin with a wooden 2 x 4 measuring 1-2 foot long. At each end of the board, CAREFULLY pound in a nail at least one inch deep. Ensure that the nail is secure. It will be holding the tension of the string. Note: Make sure to find the help of a trusted adult before working with hammers and nails! Always use gloves and safety glasses to protect yourself! Your well-being is your top priority. Tie fishing line to one nail, run it the length of the board, then secure it very tightly to the other end. Keep the distance between the string and the board within a half-inch so that you can press down the string to produce different pitches. 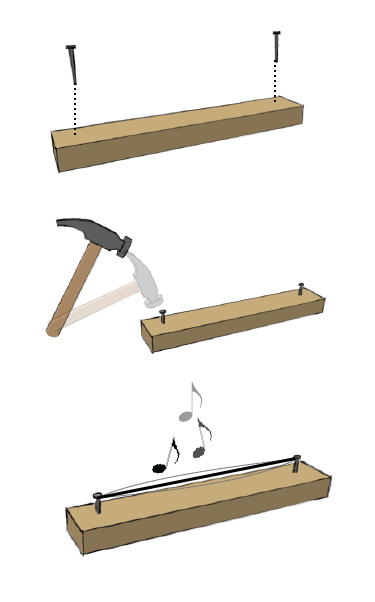 Using a more detailed construction, we can build a different Monochord that plays adjustable pitches. This instrument would be more similar to a professionally built instrument, used by traditional musicians who study and play ancient monochord music. 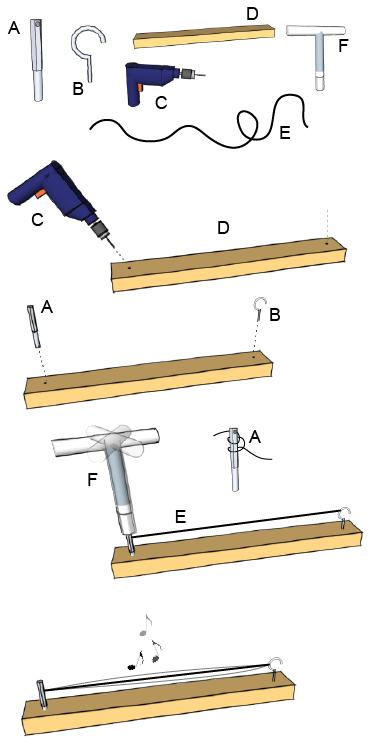 Materials needed include a 1/4” diameter tuning-pin, a tuning wrench, a 1/4” diameter brass hook screw, a 32 inch wooden bar, an electric drill with 3/16” drill bit, and finally, fishing line. Begin with a piece of wood about 32 inches long. Drill a 3/16” hole about 1.5 in from one end at a 70-degree angle facing outwards. On the other end, drill a vertical 3/16” hole. Note: Make sure to find the help of a trusted adult before working with screwdrivers! Always use gloves and safety glasses to protect yourself! Your well-being is your top priority. Screw the brass hook in the vertical hole, and place the tuning pin in the angled hole without tightening it down yet. Tie the fishing line to the brass hook, and then thread it through the tuning pin. Use the tuning wrench to tighten down the pain and strengthen the tension of the string. Pluck your instrument and listen to the sound! Try adjusting the pitch by tightening, or loosening the tuning pin. Be careful not to tighten the string over, as it could break. You don’t have to be a professional musician to play around with aerophones, or musical instruments that produce sounds from vibrating columns of air. In fact, you can create your simple flute from an everyday object you normally would recycle: the plastic water bottle. Search for a clean, empty, 20 FL. oz. water bottle. Place the edge of the opening on your bottom lip and blow a thin, steady stream of air over the opening of the bottle. You should hear a whistling tone, even if it is faint. Experiment with filling the bottle and blowing into it again. What happens when the volume inside is smaller? Bigger? How does the pitch change? What if you were to cut into the bottom of the bottle and create more openings? Experiment with ways to alter your sound. If you can find access to specific materials, you can construct your basic flute capable of playing different pitches and melodies. Are you up for the challenge? First you’ll need: 200 cm length of ½”copper pipe, pipe cutters, and a ruler. Begin by cutting the copper piping into eight pieces with the following lengths in cm: 32.6, 29, 26, 24.5, 21.8, 19.5, 17.3, and 16.3. Hold a cut piece vertically, place it on your bottom lip and blow a steady, thin, stream of air over the opening. How does the length of the tube affect the pitch? Arrange the eight pipes in a row from low-pitch on the left, to the high pitch on the right. Finally, discover you own inner designer! These pipes have to assemble somehow to produce a single instrument, and why should we tell you how to do it? Experiment with your assembly! Can they be tied? Glued? Lined up on a board? 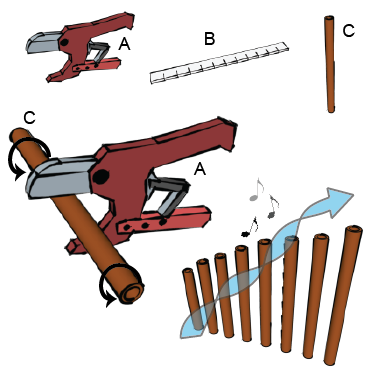 Draw plans to assemble your pipes, and then construct a beautiful pan flute. Upload your pictures below to show off your craftsmanship! Another instrument type, known as the idiophone, uses a vibrating solid, such as wood, or metal, to produce sounds. You have likely heard idiophones before: Clarinets use a vibrating reed; xylophones use vibrating wooden keys; even wind chimes use poles, which collide and vibrate in the wind. 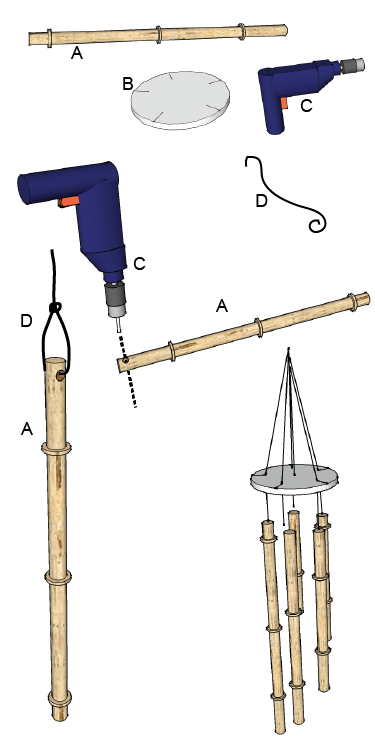 Here are steps to produce a bamboo wind chime. First, you’ll need a 3 foot length of ½” diameter dry bamboo, fishing line, cardboard, a drill, and a saw. Start by downloading and printing the template in the link, which you will use to cut the cardboard circle. Glue or tape the template to the cardboard, then cut along the lines. Create a circle with five slits for the string. Cut your bamboo shoot very precisely into five lengths: 20 cm, 18.9 cm, 17.8 cm, 16.3 cm, and 15.4 cm. These specific lengths produce the pentatonic scale, which is made up of 5 pitches (Penta is a Greek prefix for five!) . Wind chimes are often based on the pentatonic scale because its notes always sound good together. Jazz and Rock ‘n’ Roll musicians will even improvise using just those five notes to make an easy melody. Drill into the bamboo pieces, and string them to the circle, as shown in the picture. Your wind chime is now ready to play in the wind! Try hanging it outside to see if you can make sense of the random melodies and harmonies made by the wind. If you are interested in making a permanent outdoor windchime, try substituting plywood for cardboard. Ask an adult for assistance with a saw. While a wind chime relies on the motion of the wind to produce sounds, A Chime alone is a musical instrument, which can produce specific melodies and harmonies using a mallet. You can create your own with more advanced materials and techniques. First, you’ll need one 2x4” plank of wood measuring 48cm long; one 1x4” plank of wood measuring 48 cm long; two wooden dowels measuring ½” in diameter and 30 cm in length; 18 small brass hooks (available at a hardware store); one 150 cm length of copper pipe measuring ½” in diameter; pipe cutters; electric drill; rubber bands. Using the pipe cutter, begin by cutting your length of copper pipe into 8 pieces of the following length in centimeters: 26, 24.5, 23.2, 22.5, 21.2, 20.0, 18.9, 18.4. Each pipe requires a hole at each end, but the distance from each end to the hole varies by pipe. They are, respectively, 6.5, 6.1, 5.8, 5.6, 5.3, 5.0, 4.7, and 4.6 centimeters. Always seek help from an adult, and use proper safety gear. 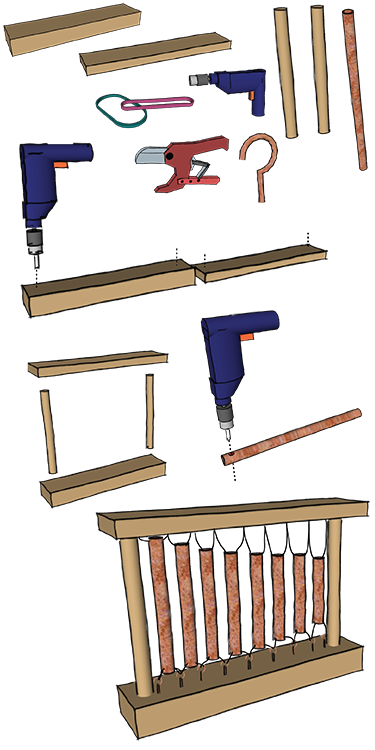 Mark off dots along the center of the 2x4 and the 1x4 planks at 4 cm intervals, and drill with a ½” bit at the dots a two ends. This provides a posthole for our two columns. Screw a brass hook at each of the 18 remaining dots. Use a paperclip, or similar thin object to feed a rubber band through each pipe. Finally, string the pipes up to the chime as shown. Tap the pipes with a rubber mallet, or a similar hard object. Can you make a melody? What is the study of Musical Instruments? 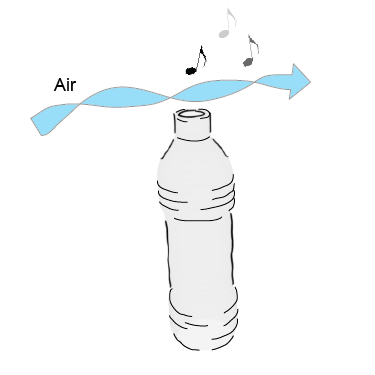 Instruments that produce sound from a vibrating column of air are known as what? What are some ways people can produce sounds? 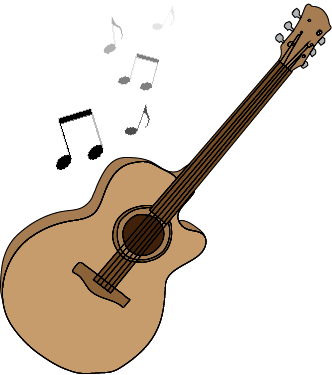 Which of the following is not an instrument category? The longer pipes of the chime sound lower in pitch. The wind chime is based on what musical scale? Musical Instruments Choose & Listen!